Clearly, I was in way over my head the other day when I wrote about fishing in Lake Placid. I learned how mistaken I was when I arrived at the real estate office this afternoon and found the owner and broker of our office, Terry Horrocks, gazing at today's featured photo, which was on his computer screen at the time. Apparently, I got it very wrong when I said this is the time of year when the rainbow and lake trout are swimming around the surface of deep Adirondack lakes such as Lake Placid. Terry's son, Zach, is an avid fisherman like his dad. 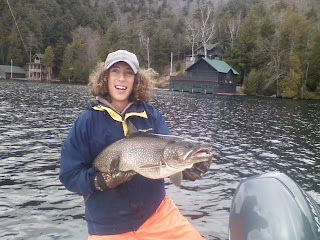 As you can see in today's photo, Zach is happily holding a very nice lake trout, caught last week on Lake Placid. Terry tells me this 34-inch beauty was caught in deep water, 40 feet or so, because Lake Placid has not "turned over" yet. Despite reading the online resources about lake turnover, I can't quite explain it to you. You'll have to wade through the explanation yourself if you are ignorant on the topic as I was. So mea cupla, time for full disclosure - I am not a big fisher person. Regardless of my size, I also do not have much experience looking for or catching fish. Once in a while, I like to fly fish if someone else is around to take the fish off the hook and deal with the slimy issues involved. I can attest however, one can catch large rainbow trout on a fly rod on Lake Placid. In my experience it had nothing to do with water temperature because the fish were hanging around near the surface looking for a certain kind of fly that hatches in the summertime, but that is another fish story all together. The point is there are indeed big fish to be caught in Lake Placid these days, but don't take my word for it. Take the Horrocks family's word for it, they obviously know what they are doing. 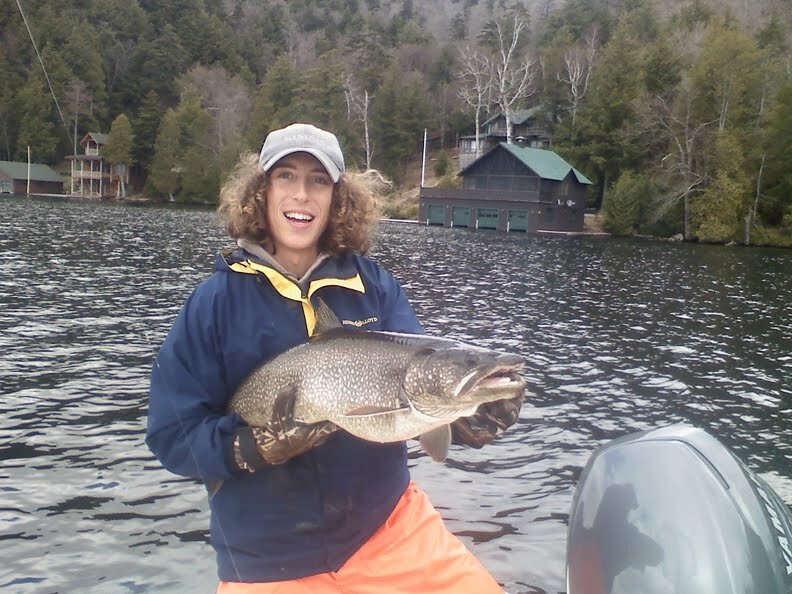 Photograph of Zach Horrocks with dandy lake trout which was caught and released, courtesy of Jesse Williams.